Information on wave conditions at the entrance of a port is important for the safe navigation of vessels. 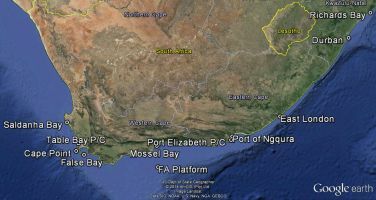 However, due to shipping in this confined area, it is difficult to monitor wave conditions right in the entrance channel. Therefore, the concept of a 'virtual buoy' system has been developed. 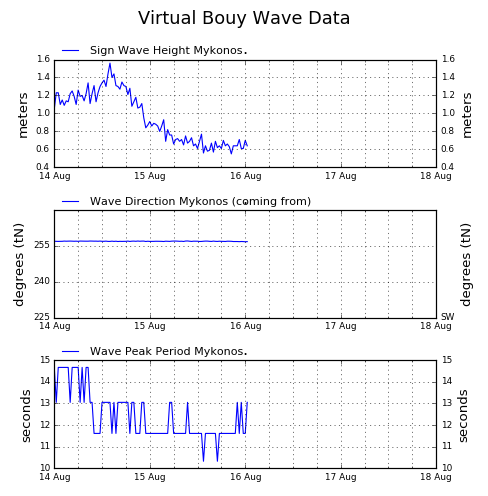 The 'virtual buoy' at a particular location is not a real wave monitoring buoy, but represents a numerical process whereby the wave conditions are determined at the location with a high degree of accuracy. The 'virtual buoy' concept has been implemented at the entrance to the Port of Cape Town and in Saldanha Bay. Deep-sea waves approach Saldanha Bay from the south-west to the north-west. Since the south-westerly waves are reduced significantly as a result of refraction, a considerable variation in wave conditions can be experienced inside the bay. The directional wave data from the Cape Point wave buoy are sent to the Stellenbosch office of the CSIR where the data are processed with the operational SWAN model. The model runs on a dedicated PC which is linked to the CSIR Integrated Port Operation Support System (IPOSS). Once the model output is available, the wave parameters are transferred to IPOSS and displayed jointly with the offshore (Cape Point) wave data, the weather and tidal information. It is recognised that the Virtual Buoy system will not provide data as accurate as measured data. However, the calibration and validation exercises indicated the present output represents the actual conditions reasonably well. Although a number of output locations are available, the wave parameters of only one location is shown on the graphs. Since the output from the system is similar in appearance to that of the measured offshore data, the output locations are in essence imaginary wave buoys or 'Virtual Wave Buoys'.